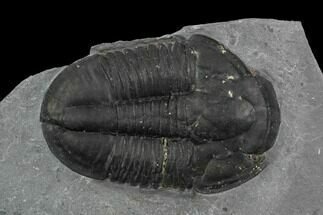 Asaphiscus wheeleri is a trilobite commonly found in the Wheeler Shale of Utah along with Elrathia kingii. They average between 1-2 inches in length and only about 10% of specimens are found with their "free cheeks" still attached (not molts). Because Asaphiscus is a thinner shelled trilobite they don't often survive the wire brush preparation used at the commercial quarries. 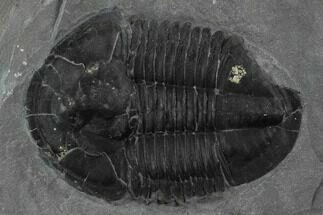 We meticulously prepare Asaphiscus trilobites that we sell under microscope using air abrasives for the best quality specimens.